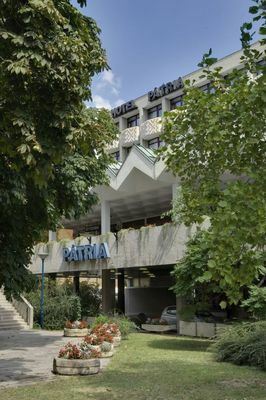 Sitting in the shadow of the historical Turkish minaret at the heart of beautiful Pécs (Capital of Culture in 2010), Hotel Pátria is the perfect spot from which to explore the city's vibrant museums, galleries, restaurants and bars. Enjoy splendid views from your room's Zsolnay-tiled balcony before sipping a coffee in the Espresso Café or relaxing on the summer terrace. 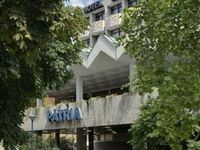 Rooms: Hotel Pátria is waiting for the guests with its 115 rooms and 1 suite. All of the rooms have minibar, tv, radio, phone and beside these you can also find a nice restaurant and banquet hall in the house. Meeting facilities: The hotel, situated in the downtown, owns 5 banquet halls, with natural light and with a maximum place of 250 persons. Technical equipment: film projector, microphone (mobile and steady), lectern, slide and overhead projector, screen, flip chart, CD record player, TV-set, video recorder, video projector, tape recorder. Gastronomy: The restaurant and the summer terrace is waiting for its guests with international and Hungarian cuisine. Programmes: sightseeing, Cathedral, Old-Christian chapel, relics of the Turkish rule, Zsolnay Porcelain Museum, Vasarely Museum. Champagne-tasting in the cellars of Pécs, wine-tasting in Villány. Bathing in Harkány (20 km from Pécs). Guest services and shops: Car park for cars and buses, room service, safe, luggage storage room, laundry, fax, photocopying, conference and banqueting facilities, non-smoking rooms. Special features: Most of the rooms have balcony decorated with Zsolnay ceramics. The balconies provide a panoramic view of Pécs. • Internet corner is available in the hotel. • Using the Internet connection is subject to charges. • The hotel is located in a paid parking zone. • The hotel's own parking lot is available for the guests at 6 EUR per car per day. • The hotel is wheelchair accessible. • Children under 12 stay free in their parents' room. • Pets are allowed for an extra charge of 12 EUR per day. Our prices contains the accomodation, buffet breakfast, sauna use in Palatinus Relax Studio, and VAT. Prices are valid if the reservation is made 7 days prior arrival. Credit card guarantee is needed to confirm the booking! Advance Purchase 60 Days:Bookable min. 60 before arrival.Full prepayment at the time of booking. The amount prepaid is non refundable! • Reservations can be cancelled free of charge until 18:00 on the day of arrival. • In case of late cancellation or no-show the hotel charges 100% of the booking value as penalty. • Rates exclude tourist tax (1.50 EUR per person per night).